In addition to the twenty-eight-minute walking program outlined above, you should consider also adding the flexibility exercises described below to further improve your circulation, balance, and strength. I call each of these ten exercises “FlexSkills,” and I’ve used them to help elite athletes in virtually every type of sport improve their stress resilience, flexibility, and resistance to injury. For each FlexSkill, you want to “hold” the position for thirty to sixty seconds. Each “cycle” of ten exercises, then, takes only five to ten minutes and can be performed either as a warm-up/cool-down on the days that you also do your Interval Walking or as an exercise circuit on its own. For example, you could go through all ten FlexSkills two or three times as your workout instead of walking. You may also want to use a floor mat or large towel when performing these skills. This FlexSkill is another two-part movement that targets multiple joints simultaneously, while at the same time improving muscle strength and balance. The primary idea behind this movement is to get the upper- and lower-body connective tissues aligned and working in concert with one another. In some forms of yoga, this Multi-Split movement is known as “the Stork” or “the Tree” and sometimes as the “Crescent Lunge,” depending on the direction of the movement. 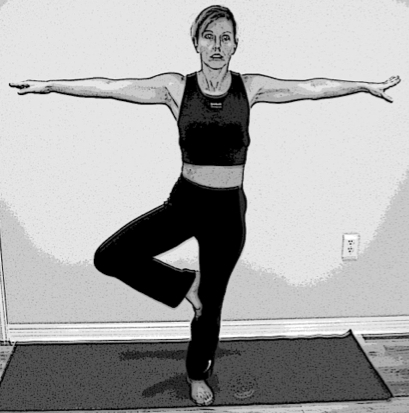 Start from a standing position with your toes pointing straight ahead and your arms at your sides. Take a deep, cleansing breath. In the first part of the movement, extend your arms upward and away from your sides so they are parallel to the floor. Then, bring the sole of your right foot slowly up the inside of your left leg, raising your right foot as high as feels comfortable for you. Continue maintaining a slow, deep rhythmic breathing pattern (and your balance!) as you hold this position for fifteen to thirty seconds. Slowly return your right foot to your mat and repeat on the other side. In the second part of this FlexSkill, you will start from the same standing/toes-forward/arms-at-side position. Take a deep, cleansing breath, look straight ahead, and step forward with your right foot. Keeping both knees pointing straight ahead, bend your right knee into as deep a lunge as feels comfortable. Continue your slow, deep breathing while you reach your arms upward straight over your head. Imagine lengthening your spine from your lower back all the way up to the ceiling with each breath. 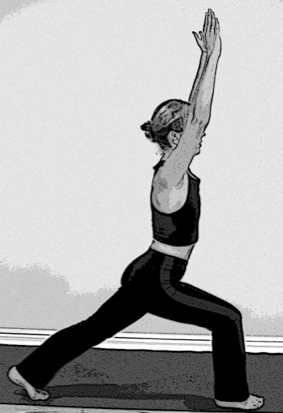 Hold this position for fifteen to thirty seconds before slowly returning your arms to your sides and stepping back from your lunge into your starting position. Repeat with your left leg. After finishing this last FlexSkill movement, you should come back to a resting position for a few last deep, cleansing breaths. You can use a comfortable standing position, the Squat position, or even the Child’s Pose to bring it all together to a relaxing conclusion. Experiment with each position to determine how you best like to end each FlexSkill session, or try ending with a different position each time.